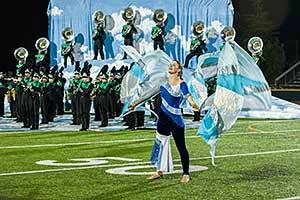 The Horns, Color Guard (flags, rifles and visual), Pit (stationary percussion) and Battery (marching percussion) work together to produce a dazzling fall field spectacular. Band members begin their preparations for fall at the two-day June Band camp. During the summer, Band students attend sectionals (mini rehearsals with others who play the same instrument) and practice their music. Weekly clinics may be scheduled and all "in town" members should attend. 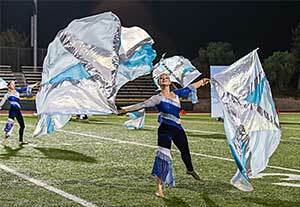 The Color Guard and Drum Line conduct rehearsal and training clinics at additional times throughout the summer. Dates will be posted on the band calendar. All of the marching band students and staff come together at August Band Camp. The excitement and hard work of band camp culminates with our Annual Family Night where Boosters get their first chance to see the show that will soon become the stuff of memories. 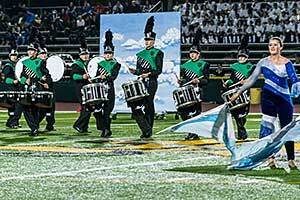 The show is rehearsed and perfected in weekday afternoon practices after school until the season ends in late November. Full participation at all rehearsals and at Friday and Saturday performances is required for the success of the program. 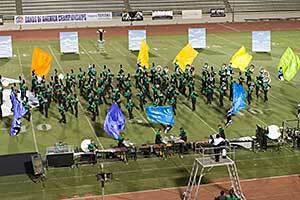 The Lancer Band has been the recipient of many prestigious awards. 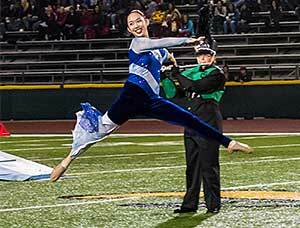 In January 2010, the Lancer Band was the Grand Master Champion at the Fiesta Bowl National Band Competition, also receiving top honors for many "captions" at that event. In 2005, the Lancer Band competed at the Bands of America Grand National Championships in Indianapolis, Indiana where they were semi-finalists. The Lancer Band also received a special top honor at the 2005 Bands of America Grand Nationals competition: the "Al Castronovo" Memorial Espirit de Corps Award! This award is bestowed on one band at each Grand Nationals competition, the one band that best exemplifies the best qualities of what the Bands of America program is all about: "pride, spirit, enthusiasm, friendliness, and unity of purpose." The history does not stop there. 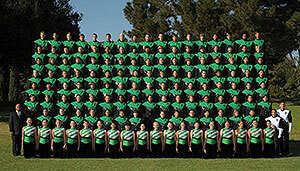 The Lancer Band has received top honors at many local, regional, state and national competitions.